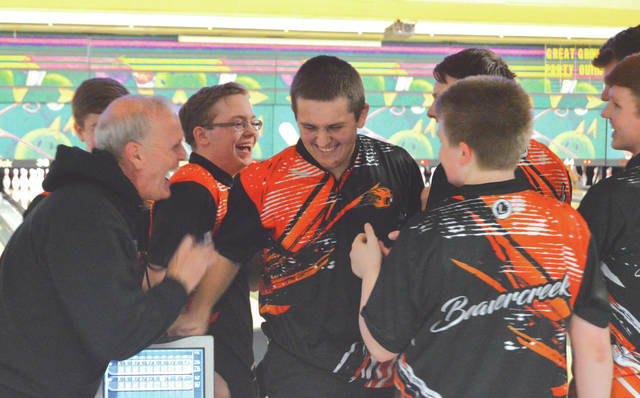 Senior Grant Reeve (center) shares a laugh with coach Bob Bobbitt (left) and the rest of the varsity boys team after tossing a 299 first game, Jan. 15, in a high school bowling match against Wayne, at Beaver-Vu Lanes in Beavercreek. 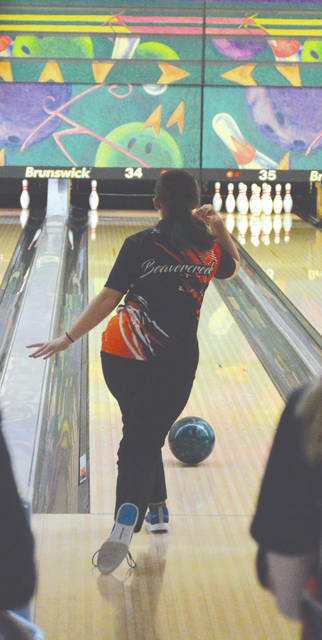 A member of the Beavercreek girls team tries her luck at picking up a 7-10 split, during Tuesday’s girls high school bowling matchup against Wayne, at Beaver-Vu Lanes in Beavercreek. 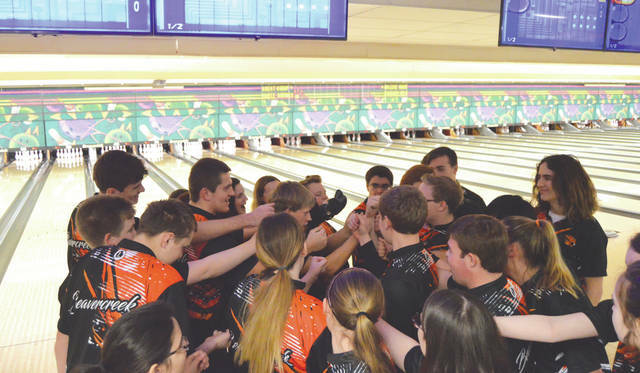 The Beavercreek varsity and junior varsity bowling teams cheer during a team huddle prior to their Jan. 14 high school bowling matchups with Wayne, Jan. 15 at Beaver-Vu Lanes in Beavercreek. BEAVERCREEK — Aside from the sounds of pins falling down on the adjoining lanes, the Beavercreek and Wayne High bowling teams and their fans got eerily quiet during the opening game of their Greater Western Ohio Conference bowling match, Jan. 15 at Beaver-Vu Lanes. That’s because Beavers senior Grant Reeve was throwing his final ball in the 10th frame, with a chance to score a perfect 300 game. Nobody wanted to move, for fear of somehow jinxing him! Reeve left the 10-pin on his final toss to record a near-perfect, career-best 299. … And he’s not even the Beavercreek boys team’s top bowler! That’s the kind of season the undefeated Beavercreek boys team is having. The boys (8-0 overall, 7-0 in the GWOC East) claimed a 2,678 to 2,162 win over the Wayne Warriors (2-5, 2-4 GWOC East), while the girls team was nipped by 70 pins, 2,077 to 2,007. Reeve said he’d thought he’d messed up the chance at perfection in the eighth frame when the ball had “a weird carry,” and took out all the pins in almost domino fashion. “And that last shot felt like it was my best shot of the day, and I happened to leave the 10 pin. Reeve is on a talent-laden Beavers boys team that places him behind three teammates, in terms of season average. Michael Donahue leads the way with a 233.1 average, followed by Brent Shroyer (226.7), Seth Koloski (222.6) and then Reeve (218.5), but Reeve now has season highs for game and series (563), which were both set on Tuesday. In the boys win over Wayne, Reeve led the way with his 299 game, and a 264, as part of a 563 series. Shroyer was next with a 478, while Koloski (231), Anthony Dorsten (221), Donahue (212), Scott Thompson (190) and two sub bowlers (179 and 162) tossed single games. In the girls match, Paige Rockwell threw a 192-182 — 374 series, Josselyn Terpenning rolled a 348 series, and Jenna Morgan had a 314 to lead the Beavers in their narrow loss. A sub bowler rolled a 269 series, while Kera Michaels (170) and Jacqueline Jones (164) contributed with single-game scores. The Beavercreek girls are now 5-3 overall, 4-3 in the Greater Western Ohio Conference’s National East division. Wayne’s girls are now 2-5 overall, 2-4 GWOC East. Waynes’ Kiersten Schooler led all girls with a 171-219 — 390 series. Beavercreek won the girls state Division I bowling team titles in 2007 and 2014. The boys won in 2015. Both Beavercreek teams will next host Franklin in a non-league battle, at 4 p.m. Thursday, Jan. 17 at Beaver-Vu.